What is Average True Range? In search for more useful indicators of price movement and strength in the market, J. Welles Wilder, creator of popular ones such as the Relative Strength Index (RSI), the Average Directional Index, and the Parabolic Stop and Reverse, has developed yet another indicator that is used in the core of technical analysis. This engineer introduced in 1978 the average true range indicator as a measure of volatility. Seeing the importance of the concept in increasing profitability from the correct timing of a trade, Wilder proposed a tool that can cue traders on when to enter or exit trades based on the price movement of products. In this way, traders can use the mediating factors of the indicator to know the right values that will yield a profitable trade. Wilder allowed technical traders to detect limited gaps, moves, and high-to-low ranges that should determine the “true price range” of a commodity. In his trend-research book, New Concepts in Technical Trading Systems, Wilder discussed the Average True Range (ATR), not as a signal for the price trend of a commodity, but as an indicator to test the degree of its volatility. Traders who can gauge the strength of a trend can take advantage of positioning in any financial trade. In calculating risk, this indicator is especially important in sizing potential adverse price movements. This condition is common in stop-order situations, where a stop price is set, and a buy or a sell is made once the price reaches that stop. Although some may say that ATR is less frequently used than standard indicators, this tool can help a trader know the condition and sentiment of the market in the entry and exit of trades. ATR is truly an adaptive and universal measure of market price volatility. To dig deeper into this indicator, we’ll take a look at how it is derived and how it is used. Before we define the TRUE range, we must know that the range of trading in a day is simply the lowest price of the day subtracted from the highest price of the day. and the absolute value of the difference between the latest low and the previous close. In the computation for true range, absolute values are used to ensure positive numbers, because we are interested in measuring the distance between two points, not the direction. It is also worth noting that the true range includes yesterday’s closing price if it is outside of the price range for today (between high and low). The inclusion simply means that the true range covers any overnight gap that may have taken place from the previous day to the next. where n is the number of data points and TRi is the true range value for index i. The range or true range of a bar is the high minus the low. 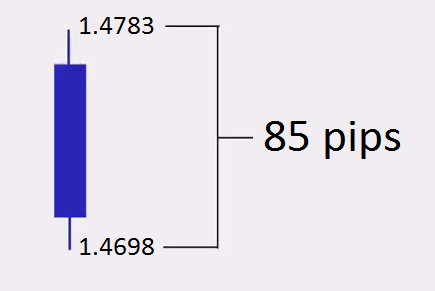 If the high of a bar is 1.4783 and the low was 1.4698, then the range of the bar is 1.4783 minus 1.4698, which is 85 pips. ATR comes into play when more than one bar is considered. For example, let us take 10 as our period. To calculate the ATR, we take the average of the ranges of 10 bars, starting with candle number 1, and then taking the range of candle number 2, and so on. The average of those ranges is the ATR. This is particularly useful because it gives trader an idea how many pips a bar is likely to move. Those who want to improve their entry points should consider using a limit or stop order. 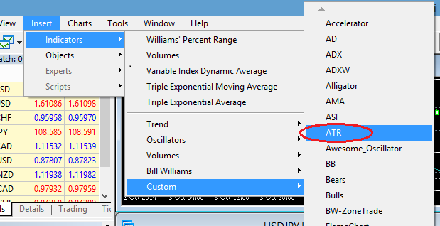 To add ATR to MetaTrader 4 or 5, simply click on the Insert menu, and then click on Indicators->Custom->ATR. Similarly, you can also open ATR through the Navigator on the left panel. Once clicked, the dialog to add the ATR comes up. The Inputs Tab lets you enter parameters for your indicator. Normally, we can set the ATR period to 14 days. Price levels can also be added to the indicator for visibility. 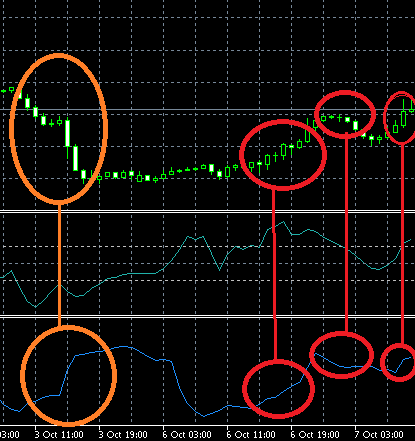 The trader can also set the fixed minimum and fixed maximum values of the indicator as well as its scale percentage. Once all the settings are filled in, adding the indicator will be seen in the charts. The following example is an ATR(14) of GBP/USD. 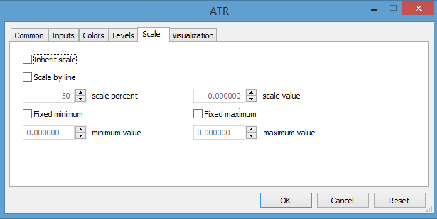 To analyze the ATR indicator, let’s consider a snapshot of the same ATR as above. The green bars above indicate the price and the blue line below indicates the ATR. As we notice, the first pair shows a mild drop (a slight change) in the price, thus the small incline of the indicator. The second shows a drastic drop in price and a corresponding jump in volatility as shown by the ATR. The last pair shows stability as shown by the drop of the ATR. ATR was initially used for the commodities market where volatility is more prevalent. 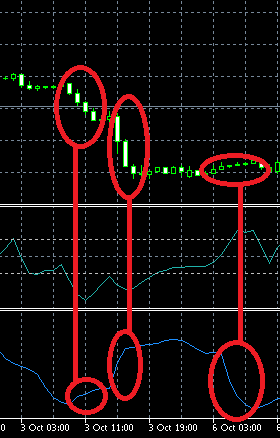 Forex and binary options, however, are also using this indicator. Traders rarely use a measure to anticipate future price movement directions, but instead use indicators to gain a perception on the recent historical volatility and to prepare an execution plan for trading. A reliable trading strategy is important in building a successful trading portfolio. Many people fail to realize that all aspects of the financial market are constantly changing; a 50 pip difference today may be increase or decrease in a few days. Adopting sound binary options strategies improves the experience levels of traders in finding a long-term trading strategy. One use of ATR in binary options is to know when to trade. As seen the following diagram, still showing a snapshot of GBP/USD with ATR(14), we see four pairs of encircled areas. The first orange pair does not correlate vertically to each other, meaning that the rise of the price is not the same with the movement of the ATR. The three red pairs, however, show the price movement to have a direct relationship with the indicator. How each pair correlates in terms of direction to one another is the focal point of the trading signal. When a correlating movement between our assets trend and the ATR line is seen, this is considered as a signal to place a trade in the direction of the trend. If we see an upward movement with our assets trend and the ATR line, then we place a CALL option, and a PUT option if otherwise. Therefore, the first and the third red pairs should indicate a CALL opportunity, whereas the second red pair should influence the trader to purchase a PUT option. By simply minding the expiry times for these signals, all things considered, they won’t often exceed the historical trend that is indicated in the chart. Read more articles on Education. Do you trade binaries on demo account? Yes, I trade only on demo. Yes, but I also have a live account. No, but I traded on demo before. No, never tried demo trading in BO.